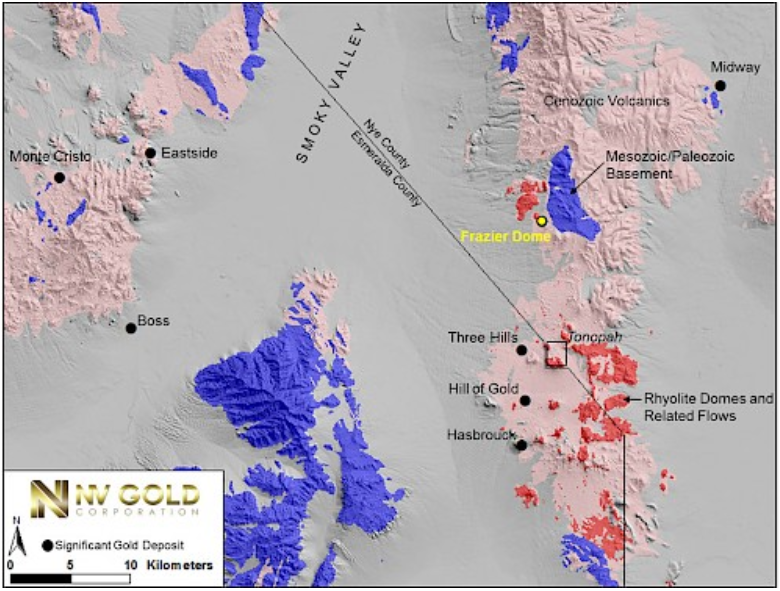 NV Gold (TSX-V:NVX) (US-NVGLF) has big plans for 2019 having just doubled the claims on its flagship Frazier Dome Gold Project in the famed Tonopah Gold District of Nevada. On Tuesday, NV Gold released its summer exploration agenda, in conjunction with announcing it has staked an additional 71 claims, thereby doubling its land position at the Frazier Dome Gold Project to 143 claims. NV Gold has been evaluating the 1,195-hectare property since it completed a relatively small drill program in the second half of 2018, which potentially may have identified the possibility of a mineralized gold system at depth – something relatively unusual for Nevada, which has built a gold-mining reputation on a foundation of low-grade, but high-tonnage mines, where disseminated (microscopic) gold is mined close to surface and heap-leached at reasonably low cost. 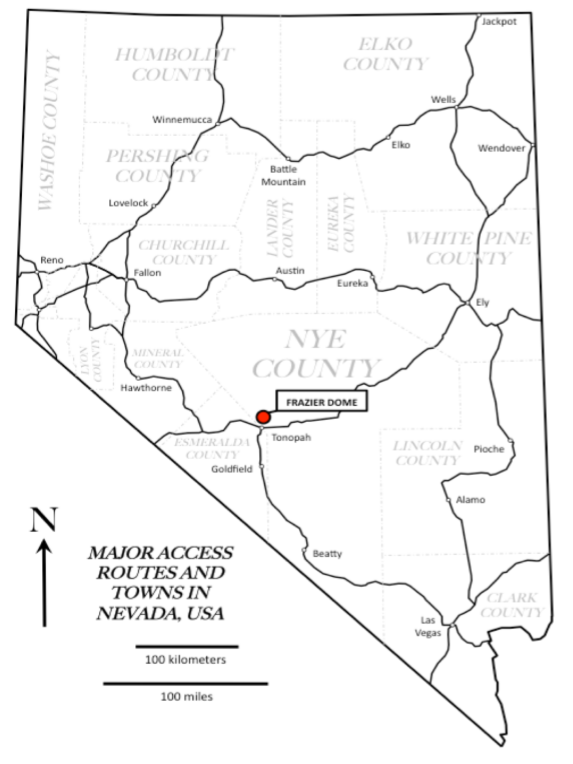 Frazier Dome is about 13 km north of the Tonopah Gold District – which historically produced 174 million ounces of silver and 1.9 million ounces of gold – on the border of Nye County and Esmeralda County. The project is a low-sulfidation, volcanic-hosted epithermal gold system with high-grade mineralization in three settings, explained in detail below. Drilling between 1980 and 1991 intersected significant gold mineralization, but it was shallow – under 150m, and never followed up on. Not all the outcroppings or mineralized areas under ground cover were tested. NV Gold’s primary target is the gold mineralization adjacent to and at depth to an intrusive rhyolite dome, especially at the basement contact, known to be a setting conducive to the development of high-grade epithermal mineralization elsewhere in Nevada. That gives a decent picture, to the trained eye, but let’s unpack this information. First, what is epithermal gold? A clue is in the name. In Greek “epi” means shallow and “thermal” refers of course to heat, in this case, heated fluid necessary for the deposit’s formation. Millions of years ago, volcanic activity deep in the Earth’s crust thrust boiling hot liquid to surface, containing minerals like gold and silver that precipitated into cracks in the rock. Epithermal veins can stretch hundreds of meters deep and are usually narrow and high-grade. In conjunction with these veins, are large alteration “haloes” of mineralization made by circulating hydrothermal fluids. While usually high-grade and close to surface, epithermal gold deposits are generally low tonnage, unlike Nevada’s three northwest trending belts: the Carlin, Cortez and Walker Lane trends, which are three of the world’s top mining districts. Epithermal deposits are divided into low-sulfidation and high-sulfidation. Low sulfide deposits are formed when groundwater comes into contact with molten rock deep underneath volcanoes. The water dissolves silicate minerals along with gold, silver, arsenic, cadmium, lead, zinc, antimony and mercury. As the super-heated groundwater moves up towards surface, the minerals are deposited in cracks and faults in the rock, mainly within quartz. High-sulfide epithermal deposits are richer in sulfide minerals like pyrite, enargite, gold and silver. They are often linked to porphyry copper-gold deposits. Younger, low-sulfidation, gold-rich mineralization related to intrusive rhyolite domes, which have been the focus of West Kirkland Mining’s Hasbrouck, Hill of Gold and Three Hills mines to the south (total combined production of 1,063,000 ounces gold and 16,345,000 oz silver; and Allegiant Gold’s Eastside project 32 km to the west, which has shored up an inferred resource estimate of 654,000 ounces gold and 3.9 million ounces silver. A rhyolite dome is a mound of rock containing rhyolite, a type of igneous rock formed when lava exudes from a volcano, creating a dome-like structure around the vent. The presence of a rhyolite dome at Frazier Dome is significant, because all of the other domes (cited above) around it have unearthed significant gold mineralization. Frazier is one of the last unexplored rhyolite domes in Tonopah. To NV Gold, Frazier Dome became an immediate focus based on reported widespread alteration and gold-silver mineralization across the property, with high-grade (10 g/t) or greater gold values found in three separate settings. One of the high-grade areas is associated with quartz-filled fractures at the surface, with samples from a collapsed adit (entrance to an underground mine) running as high as 11.25 g/t gold. The second high-grade zone occurs a few hundred meters to the north as an historic drilling intercept, at the contact between overlying volcanic rocks and basement rocks, with 3 meters of 7.5 g/t gold, including 1.5m of 10.39 g/t gold. The third high-grade area is associated with a shaft and decline, referred to as the Dalton shaft in earlier historical reports. The partially collapsed shaft is shallow at around 6m deep and is associated with silicified breccia stockpiles at the surface, and a thin (2.5-cm wide) quartz vein that contained masses of visible gold up to an estimated 0.75 ounces (23.3 grams) in individual samples. Work here dates back to at least the 1970s, with samples containing as much as 14.7g/t gold. The question for Peter Ball and NV Gold’s geologists is, what is the relationship between the high-grade, gold-silver anomalies found throughout the property, and the rhyolite dome that started off as a sort of slurry pipe, carrying mineralized fluids through the volcano to surface, where the lava cooled to form a dome-like protrusion? The answer is tantalizing. To gather more information about the project, a short 8-hole drill program (1,408m) was set up for three weeks in the fall of 2018. Nine targets were identified. All 8 holes encountered long runs of altered and mineralized rock, with “the most intense alteration associated with silica and pyrite in breccia zones”. The strongest intervals were 12.2 meters 0.53 g/t in Hole FD-8, and 7.6m of 0.38 g/t in Hole FD-1. Despite relatively low grades ranging from 0.005 to 0.020 g/t gold, assaying long continual runs of detectable gold occurred in FD-1 (~105 meters), FD-2 (~150 meters), and FD-5 (135 meters) is an excellent sign. 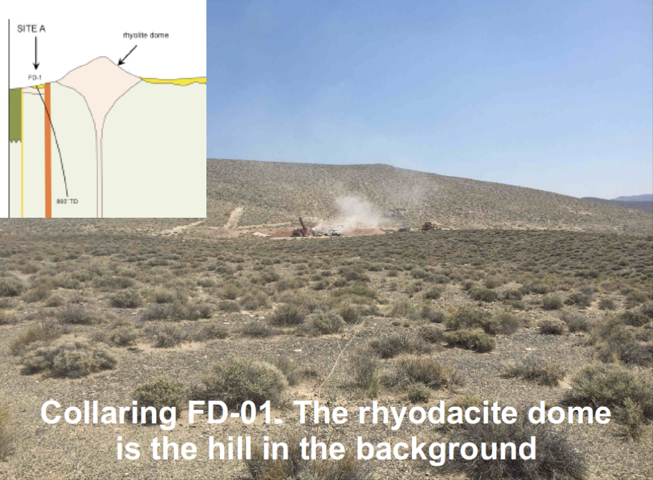 Ball explained that the plan was to drill an at angle under the rhyolite dome, aiming for what NV Gold thought was the feeder zone that transported fluids through the volcano, but “the drill hole deviated to near vertical, thereby missing the feeder zone”. This summer, a drill crew will follow up that hole. The most interesting thing about the 2018 drill program though, which left five target areas left to test, is the possibility of “an interpreted model of a potential robust gold system at depth”. A strong indication is that 5 of the 9 widely-spaced holes delivered gold intersections greater than 0.10 g/t, and up to 1.035 g/t. In three of the holes, anomalous gold was found in every 1.5m section, all the way from surface to the bottom of the hole, to a depth of 150m. “Our model is leading us to believe there may be a potential a high-grade system sitting at the base of the volcano, sub-150 meters, that developed into this halo of anomalous gold above. 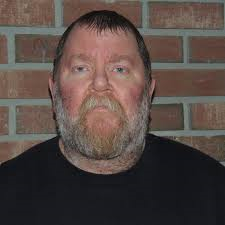 In laymans terms, the anomalous gold made it its way through the fractures all the way up from below where our holes eneded in 2018,” Ball told Ahead of the Herd. Note: Dr. Marcus Johnston recently joined NV Gold, after 25+ years working in Nevada for such companies as Newmont Gold, Renaissance Gold and Victoria Gold, and has evaluated more than 500 projects across the state. Before the drills start turning, however, Ball and his team want to glean more information about known targets and to identify new targets buried elsewhere on the property. This will include mapping, a sampling program and structural analysis, combined with a geophysical program comprising gravity and magnetic surveys. Drilling is planned for late June or July. Junior gold investors sometimes overlook Nevada, thinking that all the precious metal has been found. While the western state certainly has been well-explored and mined, there are pockets of undeveloped ground. NV Gold’s Frazier Dome project is an example of a gold mineralized area that has yet to be tapped. 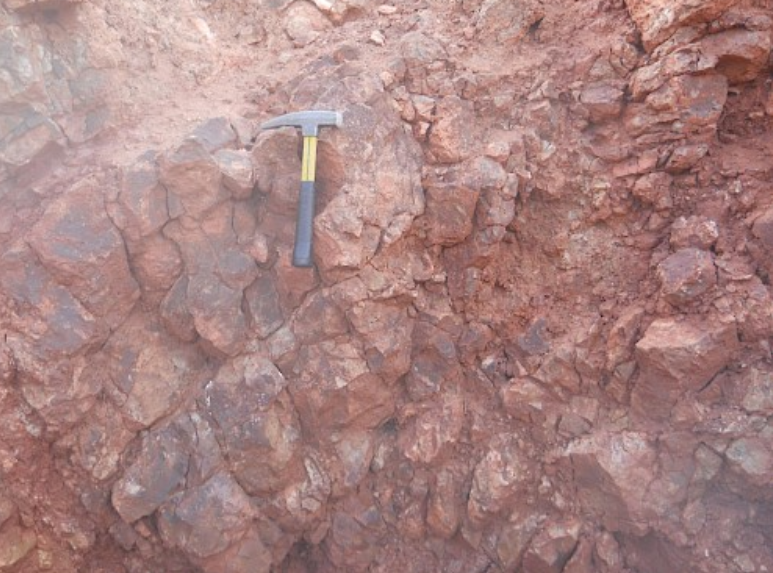 The property has closeology in its favor, with a number of rhyolite domes around it that have been successfully mined or wrapped into resource estimates. Location is also key, being within an established mining district with infrastructure – power, water and a work force – close by. And as detailed in our last article on NV Gold; a) NV Gold’s management team is superb and Nevada Veterans (Dr. Quinton Hennigh, Dr. Odin Christense, Dr. Marcus Johnston, John Watson M.Sc. ), with 125 years of combined experience in Nevada, and b) They have an incredible data set to help guide their claim staking and exploration efforts. For all of these reasons I have NVX on my radar screen.